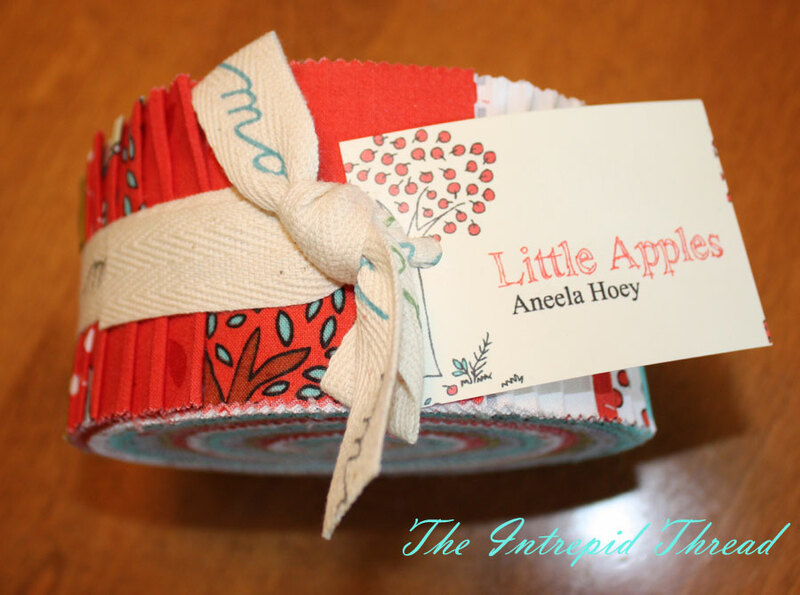 I am so happy and excited to be able to offer a Little Apples Jelly Roll as my next giveaway. Julie, from The Intrepid Thread, has graciously offered to sponsor my first fabric giveaway. She has a lovely Etsy store where she offers personal shopping and suggestions for coordinating fabrics together. She helped me last weekend to choose a few more fabrics to go with my Citrine Heirloom fabrics by Joel Dewberry, which I had bought from her a few weeks ago. Please visit Julie's shop and check out all she has to offer. She has great prices and fast shipping, too. This time you have 4 chances to win. Remember to leave a separate comment for each of the chances to win. 1. Leave me a comment telling me what you would make with this jelly roll. 2. Become a follower of my blog and/or leave me a comment that you are already a follower. 3. Visit The Intrepid Thread Etsy store, and tell me what is your favorite fabric in the shop. 4. Blog about this giveaway and leave a comment here with the link. This giveaway will close at midnight California time on Thursday, August 18, 2011. Good luck. This is such a fun fabric! Oh boy, another giveaway! I have a really cute skirt pattern that calls for a jellyroll. I also love to visit the moda bakeshop for ideas. I just popped over to the Intrepid Thread and immediately fell in love with the Pigs in a Blanket slipper pattern. I would love to try it! I think a jellyroll race quilt top for a soon to be coming baby of a friend. I'm loving the Taza, but I don't have any yet. I would make some strip pieced bags for my nephew & niece to put their car ride survivor kit toys into! I'm one of your followers, too! I love that she has the LouLouThi goodies in her shop! I'd make a cute table set....table runner, placemats, hot pads etc. I'd love to make a Little Apples picnic quilt! I love the Taza fabric line! This is a delightful fabric line. No question, I'd make a quilt. I think my fave from the shop is Alphabet Soup Girl Bundle 7 Fat Quarters Bright and White Delight, it's delightful. I'd love to make a bag out of this jelly roll - for a future teacher. It reminds me of fall! I think I'd make a birthday present for one of my god-daughters if I was lucky enough to win! I LOVE this range!! Pick me! Pick ME!!!!! Intrepid Threads has fabulous fabric, but I love the Mad Hats quilt pattern! Think I need to buy one of those! Hello - I`m a follower! If I was lucky enough to win, then I would make a quilt for my lovely 8 year old niece Poppy who lives in London! I think she would love the fabric. Julie`s shop is great - I would love some of the half yard Taza bundle in red and pink - my kind of colors! I think I would make a quilt for my niece with this fabric. I love the Taza Bundle of 10 in blue and grey. I have several books for jelly roll quilts, plus patterns I've torn out of magazines, plus patterns I've printed off the interwebz.....hopefully I could find some inspiration in all that mess! HA! The Intrepid Thread is already one of my favorites on Etsy! My favorite stuff in the store is the Heirloom line - YUM. Ooh, i've never bought a jelly roll before but i have a pattern for a placemat made from a jelly roll so that's what i'd make. Fingers crossed! ....and my fave from her shop would be Alphabet Soup Pink Girl Squared. oh i forgot i love the barnyard fabrics, i think that apple would go well with it dont you? does this comment give me another chance??? Diane, I'm so excited for you that you have a sponsored giveaway. I have on my to do list a jellyroll race quilt. I'd make that if I won! I've been a follower for sometime! I love the FQ bundle of Ruby by Joel Dewberry! I'm a novice quilter so don't know many patterns for jelly rolls (yet). I'd like to the Jelly Roll Race quilt one day soon! Great fabric. Just love this line. I'd use the jelly roll for a new pattern I've been salivating to use, orange peel. Difficult chise, but I think I like Promenade best of all. Hi, Di! I think I'd make a little layered ruffled dress for my granddaughter with this fabric - she'd love it, and the fabric is just perfect for her! I'm a follower now, too - I thought I already was, but apparently not so I fixed it! And I absolutely love the new Heirloom line by Joel Dewberry at The Intrepid Thread!! What would I do with a jelly roll? Hmmmm. Hold it, and pet it, and talk to it a bit. If it is particularly shy I'd set it on a shelf for a little while until it got comfortable. Eventually it would tell me what it wanted to be and we would take the journey together. Am now a follower. Looking forward to more random thoughts! I would use the jelly roll to make a quilt. Thanks for the chance! A string quilt would look pretty out of Little Apples. I like Taza- Cynthia in Blue by Dena Fishbein for Free Spirit. Thanks for the giveaway! i am a new follower- love to find new blogs to peruse! so many excellent choices at intrepid thread, but i guess the Pernilla's Journey - Fat Quarter Bundle of 29 by Tina Givens would keep me busy! I love Farm Fresh FQB. Off to post on my blog. Thanks so much for the chance. I think the Farm Fresh Green Farmyard is adorable! I would get my sister (YOU!) to help me make my first project! I have no idea what to make, so maybe you could suggest something??? I love the Farm Fresh bundle! I would love to make a quilt for my cousin's graduation gift! I would make a table runner and/or some placemats. I have apples as a theme in my kitchen! I love Dazzle in the orange/pink/aqua colors and anything by Lizzy House! My fave fabric at Intrepid Thread is the Alphabet Soup boy bundle since I am looking forward to my first grandson after 5 granddaughters!! I'd perhaps make a laptop cover. Great giveaway! I love the Purple Flower from the new Promenade line. Yum! I would make Marys Five Patch, its a jelly roll quilt pattern that I have. I am now a follower of your really cute blog. My favorite fabric over at I.T. is Heirloom. I would either make a cute table runner or a pieced bag. I'd make a patchwork quilt for my baby daughter! I also love the Intrepid Thread and my favorite at the moment is heirloom. I would love to make an Irish chain quilt with this collection. I'm still in love with the peeps and they are on sale now too. I'd love to make a jelly roll race quilt with this...I make quilts for the crisis pregnancy ctr., and that would be just the right size! Thanks for the chance to win! I already follow Intrepid Thread blog. She has an active online store -- I like Taza and Heirloom -and Little Apples too - my PC died Monday so am using my SIL's PC. She has all kinds of blocking on and I couldn't get to etsy. Will try to look again later. I would make a strip quilt with this gorgeous jelly roll. Thanks for the chance to win!! I am a new blog follower, too! What don't I love at the intrepid thread? Some Loulouthi yardage is next on my list - especially stockings and buoyancy in all the colourways!!! hmmm, there's so many things to make with this lovely fabric. i think i'd do a small quilt. thanks for the chance! I'd be making a quilt for my favourite little girl - my daughter! I've popped over from the Intrepid Thread and am now your latest follower. I adore Aneela's latest line, thanks for the giveaway. I THINK I'D MAKE A CHILD'S QUILT! LOVE 'HOO'S IN THE FOREST'! I would probably use these in a quilt. I would like to make a jelly roll race quilt. Thanks for the opportunity to enter your great giveaway! I am a new follower and look forward to reading future posts. There are so many wonderful fabrics at The Intrepid Thread but one that really made me smile was Alphabet Soup Pink Girl Main By Zoe Pearn for Riley Blake. Love Little Apples - a cheerful quilt would be in order. I agree with one commenter that picnic quilt would be perfect! I love the Wrenly Blue Mums! I just love Kate Spain, especially "terrain" over at Intrepid threads. I've been wanting to try one of those Jelly roll race quilts. I think I'd try that if I won your jelly roll. I've never made a jelly roll quilt but this could be my first. Thanks for the giveaway. I've been hanging out at Intrepid Thread and really want some blue and grey Taza. Now I just need to decide how much. I have never sewn with jelly roll pre-cuts so I'm not sure what I would make. However, if I owned a jelly roll I would definitely find a use for that beautiful fabric. Thanks for the opportunity. I wold probably make a ruffled quilt from these fabrics! I love the Hoo's in the forest in the Intrepid Thread's store! I would probably my one of my grands a snuggle quilt!! I love the Heirloom Blockprint Blossom in Fuschia. LOVE IT!!! I am a follower :) Thanks for the giveway...awesome!! I love the Barnyard fabrics!! I think if I was lucky enough to win, then I would make a stacked coin quilt...quick, easy, fun...love it!! I want to try to make a jelly roll race quilt. That would be a perfect jelly roll to try with. I would make a baby quilt for my "in the oven" grandchild! Love love LOVE this fabric! I would use it in a quilt for my granddaughter! Julie is so awesome, isn't she?! I would make a quilt from my jelly roll pattern book. I love every quilt in it! Little Apples screams quilt to me - perfect for my little girl. I think Julie is awesome - I am obsessed with Loulouthi, hoping she doesn't sell out before I can get the last colorway. Many thanks! Ooh, I have a Little Apples charm pack in the mail, and was thinking about buying a jelly roll of it to use as sashing! I love her Loulouthi range - already have a couple half yards of it! I LOVE the heirloom fabrics she's got! I'd make a stripey baby quilt top. It's great fabric. Thanks for the giveaway. I'm headed to the Intrepid Thread right now. I'm loving the 1001 peeps fabric she carries. Looks like there quite a lot of nice fabric to buy there. Thanks for the introduction. I would probably make a tote with it. I like the Alphabet Soup Boy Bundle 6 Half Yards Red, White, and Blue Boy. at the Intrepid Thread I like the Taza collection, I want it. Fabulous giveaway. I'd love to use the jellyroll to make a cot quilt for my six week old grandson. I'm a follower and very happy to be one too. At the Intrepid Thread shop I love Hoo's in the Forest with a yellow background. I need some new pillows for our new couch and I think the red would work beautifully with our tan couch. I'm sure I"d use this to make something fun for my twin grandkids. Hope I win. Glad I found your blog today. I saw this fabric and love the fun designs, I would make some kid's charity quilts with them. I became a follower of your blog for one more chance to win the nummy fabric roll. thanks for the chance to win. Visited Julie's (IT)Etsy store and have decided that I really like the Pernilla's Journey. I see great things happening. My blog is giving me fits so I tweeted about your giveaway. I hope that is acceptable. Thanks again. Oh, Oh, Oh - Little Apples would make a wonderful quilt for a little girl & I have one in mind! Thanks for the chance to win. I just becoam a follower of your bloog. Looking forward to seeing what you're up to. What's not to like about Alphabet Soup over at The Intrepid Thread - I love all the colorways. Hello! thanks for the chacne to win such nice fabric. I purchased a book for making quilts with Jelly Rolls and Ithink I'd use this one to make my first project form that book. wow, she does have good prices! I like the Farm Fresh FQ bundle! I'm a tote/bag and quilt kinda gal, so I'm sure I'd be making one of those. I just saw the Cartwheel Quilt on Moda bakeshop that uses a jellyroll. Looks like a fun quilt to make.